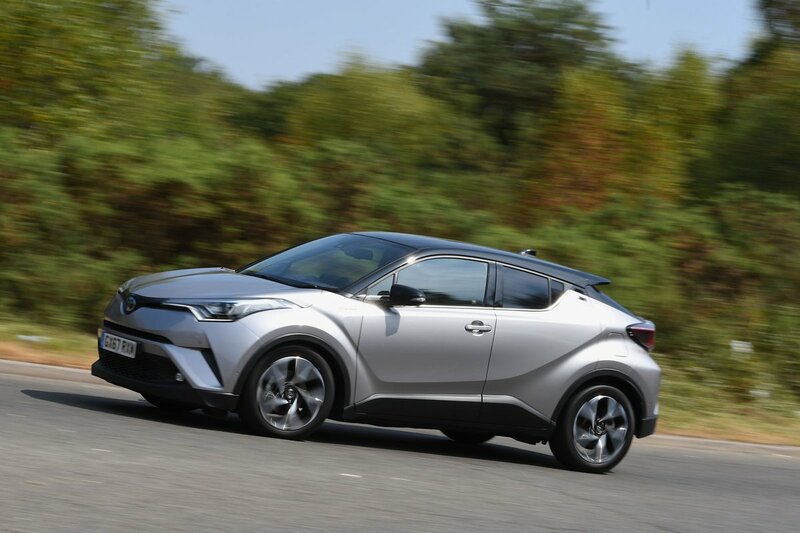 Toyota C-HR Performance, Engine, Ride, Handling | What Car? 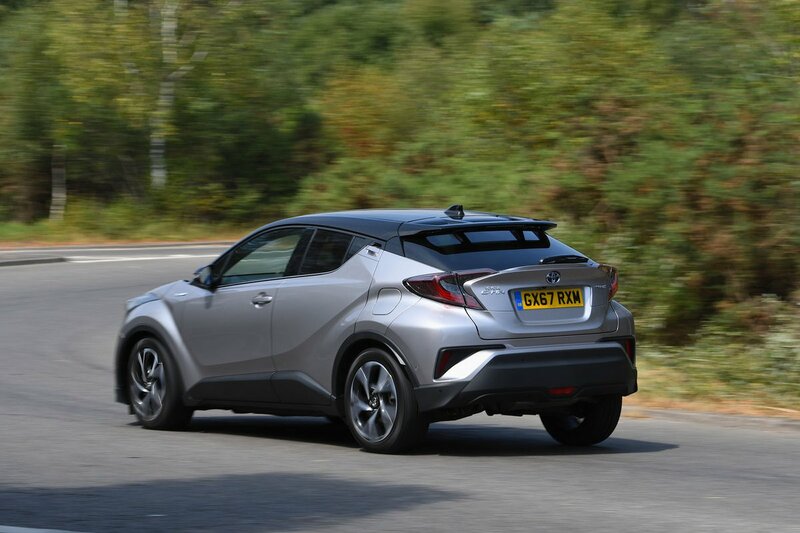 It’s best to think of the C-HR Hybrid as a Toyota Prius in a different suit of clothes. Both cars sit on the same platform and are powered by the same 1.8-litre petrol engine and electric motor, with their combined power sent to the front wheels through a CVT automatic gearbox. 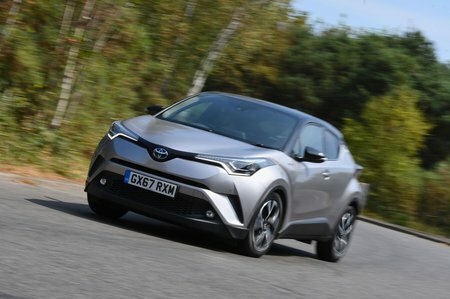 It’s a recipe that works remarkably well in the latest Prius, but the C-HR’s taller stance and heavier body do spoil things a bit. For starters, the C-HR takes noticeably longer to get up to speed, and its petrol engine always seems to be working that bit harder. Diesel rivals, such as the Seat Ateca 1.6 TDI and Nissan Qashqai 1.5 dCi, aren’t actually much faster against the stopwatch but get you up to speed in a far more relaxed fashion. The cheaper 1.2 petrol version has less power than the Hybrid but is a bit lighter, so it's actually slightly faster. Performance is roughly on a par with its key rivals, including the Ateca 1.0 TSI and Skoda Karoq 1.0 TSI. However, both of those cars are available with much more powerful petrol engines; the C-HR isn't. This depends on which engine you choose. The 1.2 petrol on 18in alloy wheels (Design trim and above) rides really quite well; it isn’t soft and wallowy like some SUVs, so there’s no nausea-inducing body bounce along undulating roads. Just as impressively, the C-HR smoothes over ruts and broken Tarmac around town better than the Seat Ateca or Peugeot 3008. The Hybrid is less impressive; its extra weight gives the suspension a harder job to do. On the same 18in alloys, things are more unsettled around town, so we suspect the 17in wheels (standard with Icon trim) might be a better choice if you’re buying this version. As with the ride, this depends a little on which engine you go for. The lighter 1.2 petrol is remarkably agile by family SUV standards, staying upright and hanging on gamely through tight twists and turns. Even its steering is accurate, delivering enough feedback to give you confidence through faster bends while remaining light during low-speed manoeuvres. Meanwhile, the Hybrid version is hampered slightly by its extra mass, so it never feels quite as light on its toes. You only really notice this on faster, twisting roads, though, and it still handles well by class standards. It’s just a pity the hybrid's steering feels a bit more artificial than in the 1.2 petrol model. At very low speeds, the Hybrid version can power itself using its electric motor only, so it’s much quieter than a conventional petrol or diesel alternative. The trouble is, even relatively gentle acceleration requires the help of the petrol engine, at which point things get a bit rowdy. The blame lies with the CVT automatic gearbox, which, whenever you squeeze your right foot, causes the revs to rise suddenly and stay high until you’re up to your desired speed, filling the interior with an annoying drone in the process. The 1.2 petrol version is quieter; it actually has a more refined engine than rivals such as the Seat Ateca 1.0 TSI. The 1.2’s six-speed manual gearbox is also light and positive and there’s enough feel through the clutch and brake pedals to make smooth driving easy. Less impressive is the amount of wind noise on the motorway.